Laura Cross is the owner, interior decorator, and a stylist of Keekï, a large homeware and furniture concept store in Melbourne. Keekï is well known for its exquisite style which has been built over the years by Laura’s impeccable aesthetics. Not only does Laure curate the most exquisite selection of items for her customers to purchase, but she also offers a helping hand to those seeking to create their personal retreat in the privacy of their homes. At Keekï’s large showroom, Laura styled a series of room settings so her clients can easily envision how specific items would look once introduced in their homes. High-quality pieces and a mix of professional styling and customer’s imagination were what made Keekï a go-to destination for retail shopping for Aussies. Other than the large range of homewares and furniture, Keekï provides its clients with interior decorating, property and commercial styling, and delivery and installation services. Before using SampleBoard to create mood boards, Laura used traditional boards requiring real samples and pictures of products from magazines to present her ideas to her customers. "SampleBoard simplified my design process." Traditional design boards are time-consuming and tedious to create, requiring physical samples and pictures of products to be sourced, collected and compiled into life-sized design boards. Laura found the process tedious and time-consuming and knew there had to be a faster way in getting her visions onto paper to present her ideas to her customers. After researching Adobe Photoshop, she found SampleBoard. Finally, a program that offers professional results with ease of use. 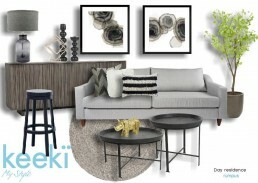 Now, Laura uses SampleBoard as part of Keeki’s In-Home Service when creating her professional interior decorating proposal, which includes a full comprehensive quote and concept development board for each room. From now on YOU too have the opportunity to create stunning design boards in minutes. Sign up for a free trial and discover why Laura chose SampleBoard as her go-to solution for visualizing her design thoughts.